I was driving down 295 when I started to get a little rumbling in my belly, and seeing how it was about lunch time, I figured that I would find a place to grab some wings. It just so happens that I was in the Hamilton/Trenton area, and I remember getting a “Suggest a Joint” from Ted who told me that I needed to stop in and grab the wings at First N’ Ten Sports Pub because they are the best. What better chance to feed my craving and check out a local hot spot all at the same time. I pulled into this rustic looking building on Hamilton Rd, walked into the dimly lit bar area, and pulled up a stool to grab a drink and menu. The ambiance was definitely low key and everyone there, being that it was lunch time, was either taking a break with subtle conversation or talking about their current jobs that they need to complete. Bars are always a different scene at lunchtime, and I actually prefer this time of day to grab wings because it’s not as chaotic. So I glance over the menu and notice that these “Famous Original Buffalo Wings” were voted Best Wings in Hamilton. Well, I already had Jo-Jo’s wings down the street not too long ago, so this would be a good opportunity to see if that statement holds any water (at least to yours truly). 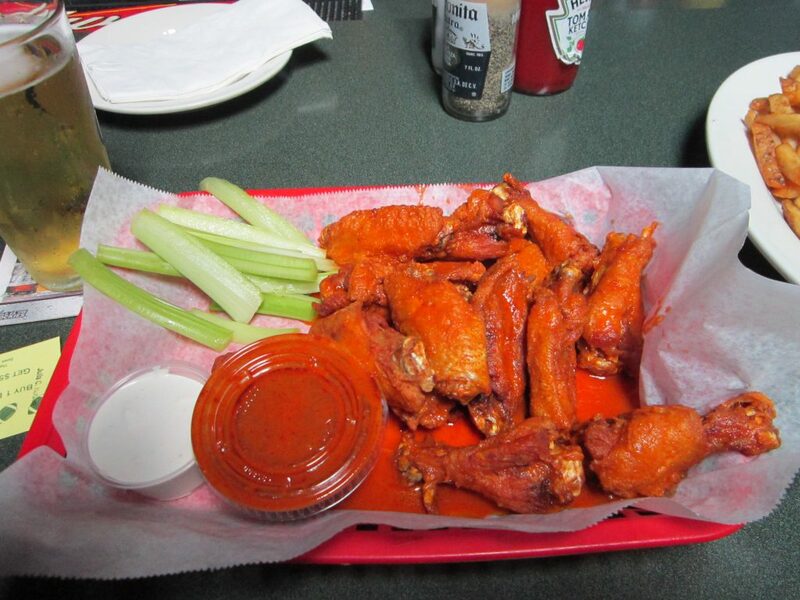 The wings came in three Buffalo styles: Mild, Hot, and Killer. Now both Ted and the bartender told me that the way to get these wings was to order them Cajun style and dip them in a side of hot garlic. Normally I would jump on a good recommendation, but because I’m searching for the best Buffalo style wing, it wouldn’t be fair to rate them against the rest of my reviews. So I ordered my 12 “Jumbo” wings with the Hot, got the Killer on the side, and my usual buddy – plate o’ fries. Now comes the worst part… the waiting. Nothing stinks more than being hungry for wings and smelling all the other customers’ food while you wait for yours to be prepared. At least I had some entertainment on the tube with “Who Wants To Be A Millionaire,” which I didn’t know was back on the air. Also, by the way, did you know that in 1987 American Airlines saved $40,000 by taking just one olive off every salad… freakin’ crazy right? The time comes when my wings finally arrive after all the wing plate teases that came before (you know that game: is that mine…no, is that mine…no) and guess what, these are and they look great. All nice and orange with a side of celery and blue cheese… and of course, my fries. I bite into them and it immediately brings back memories of Thunderbird’s with that tangy, buttery, sugary, sweet sweet sauce that makes you feel like a million bucks, which is funny because of the show that was on. The wings themselves, however, were nothing special. The “Jumbo” sized wings came out less-than-jumbo being more like a normal wing size, and the tenderness of the meat could have used some finesse. The good thing was that the quantity made up for the lack in size and I was not left feeling hungry when all was said and done. Another thing to note is that they did a good job getting a nice crisp on the skin while deep frying, and that helps because nothing feels worse in the mouth than a soggy wing. There is no denying that the real star of this dish is the sauce. As I said before, it had this incredible candy-like quality that makes you want to go back for more, time and time again. Usually when I have a sauce of this type, my stomach starts fighting back after too many wings because of the sugar content, but not here. I mean, I can’t stress enough how flavorful this sauce was. My only complaint is that it was not hot at all. The heat wasn’t sufficient enough to put that little sizzle on my lips that I enjoy, and I wonder if that was the Hot, then what the hell does Mild taste like? I didn’t have to guess with the Killer, though, as that baby just sat there waiting to be tried. And try I did. I poured the sauce over the last few wings and went to town. The Killer sauce had the same flavoring as the Hot, which I loved, but also added a ton of crushed red pepper to the mix. It amped up the heat a bit, but still nothing crazy. All it really did was make the texture more sandy on my tongue due to all that extra spice. Basically, I came in with an incredible appetite for wings and First N’ Ten didn’t let me down. I don’t, however, think that they are the best that Hamilton has to offer, but I will say that their sauce is definitely something to crave. So if you happen upon this pub during your travels and are looking for a great hangout, stop in and grab some wings… maybe the Cajun ones that Ted was talking about, because they might be great. But for me, I’ll keep on looking for the best Buffalo wings out there, which includes more than just an incredible sauce.